The Expansion Port or Memory Expansion Port on older models, also called Module or Cartridge Port. This port is a rectangular opening at the back of the C64 case and is intended for expansions of the system. Basically it has similar function to ISA or PCI ports in a PC. Since many important signals of the C64 are led to the connector, this results in a wide range of applications. From just connecting a simple reset button, a modem or an EPROM programming device or maybe a SuperCPU there are almost all imaginable expansions possible. The expansion port is mainly used for plugging in cartridges which are usually utility cartridges such as Action Replay 6, The Final Cartridge 3 etc. but also games, other software and RAMexpansion. Contrary to the user port there are no freely programmable lines on the expansion port, i.e. expansion port modules need to "listen" permanently to the data and address bus of the CPU MOS 6510 and affect the system with a conform timing. Therefore the expansion port is not as suitable for simple projects. On the positive side the connector can be made directly on the PCB, no unusual connector is needed. 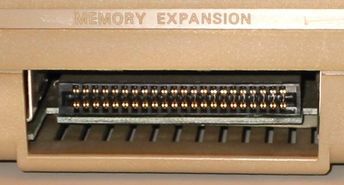 The expansion port is a 2-row EDGE connector with 44 contacts in total. The pitch of the contacts is 2.54 mm (0.1 inch). 1 GND PWR Ground Potential is 0V on ground, signal levels are measured relative this, can also be called "common ground". The maximum load for extensions is 450mA. 7 _IO1 Out Input/Output area 1 indicator Signal is low if address bus is within $DE00-$DEFF. 9 _EXROM In External ROM Similar to _GAME. During low the internal RAM in the range of $8000-$9FFF will be switched off and _ROML will be set low, if one of these addresses occur. 10 _IO2 Out Input/Output area 2 indicator Signal is low if address bus is within $DF00-$DFFF. 11 _ROML Out ROM Low Low signal if the address range is $8000-$9FFF is switched off with _EXROM and one of these addresses occur on the bus. 12 BA In Bus Available Signal from the video controller, which indicates that the bus data are valid. If BA=1 the VIC allocates the bus and no other unit can use it. 13 _DMA In Direct Memory Access if _DMA=Low the CPU can be requested to release the bus. It will stop after the next read cycle and all bus lines will go to high resistance state. So other units can use the computer hardware. At _DMA=High the CPU continues to work. B _ROMH Out ROM High Depending on the status of _GAME and _EXROM this line gets low during access to the address space between $A000-$BFFF respectively $E000-$FFFF. Condition: the internal ram area is faded out. C _RESET In Reset If this line is pulled to low, all chips will be re-initialized. The program counter of the CPU will be loaded with the reset vector $FFFC and $FFFD (normally $FCE2). This page has been accessed 28,553 times.